I'm definitely more of a piecer than a quilter so it's an ongoing struggle to tame my TBQ pile. 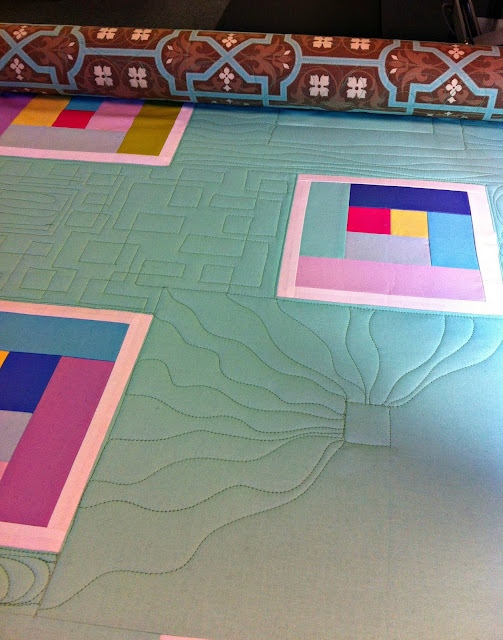 While my FMQ skills on my domestic are definitely improving there are quilts that either because of the design or their size are better quilted on the longarm. 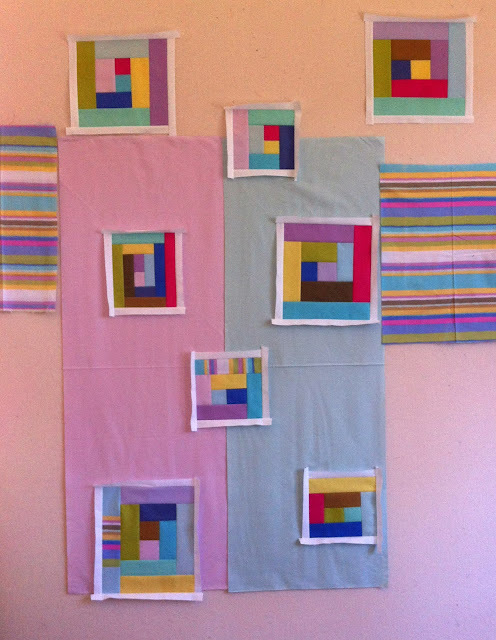 I went thru my pile and set up a series of appointments at Laurena's Longarm, my local rental spot. It's been awhile so I started with some simple pantographs to get back into the swing of things and knock things off the list but now I'm ready to do some more custom FMQ designs. I didn't want to jump right into it on my precious quilts so I decided to make a simple practice piece. 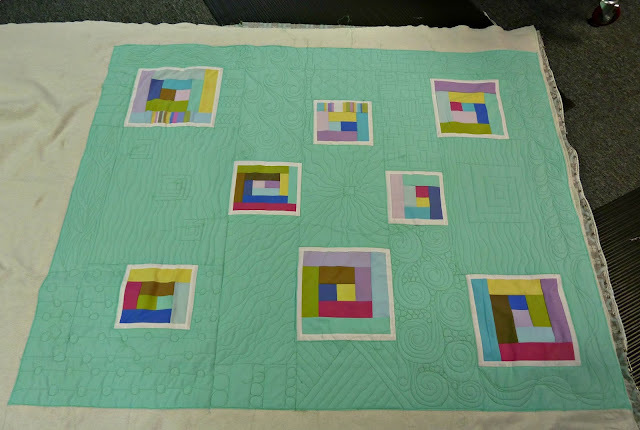 Of course it was already Thursday and I was scheduled to quilt on Tuesday so it had to be something I could whip up fast and I wanted lots of negative space so I'd have room to work on my FMQ. 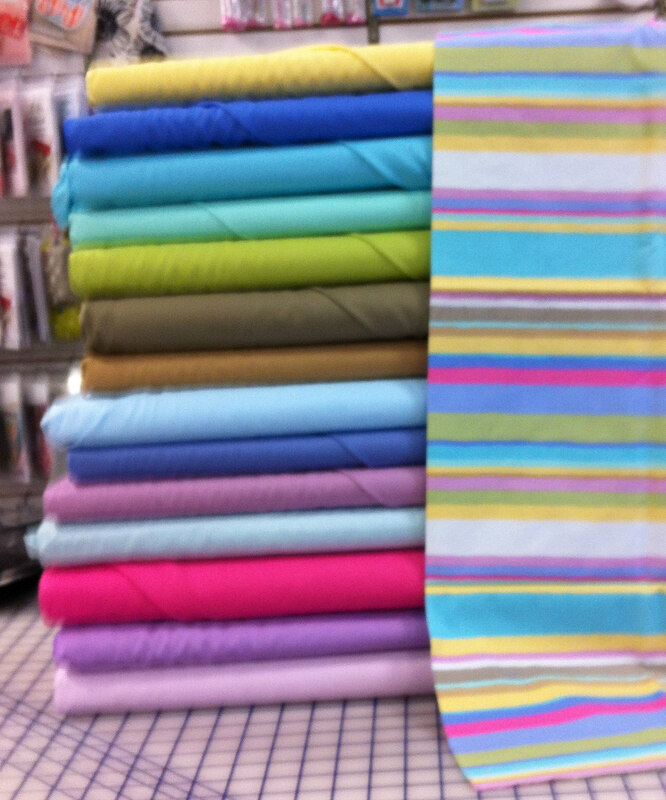 The Boston MQG has a solids challenge coming up so I thought this would be a good chance to play with color schemes. I made a quick trip over to Quilter's Way and picked up a stack of Michael Miller Cotton Couture solids that coordinate with this old fave Kaffe Fassett Serape Faded. I started with a 2"ish strip of each and improv pieced together a bunch of log cabin blocks in varying sizes and framed them with white and moved them around my design wall until I had a layout I liked. I was waffling on the color for the background until I started thinking about what to do for the back. I wanted this quilt to be big enough to be worth quilting on the longarm but wasn't thrilled to be buying another 3+ yards of fabric for a back. 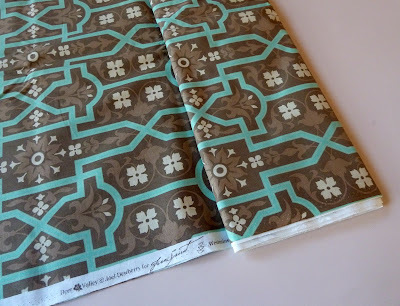 I started shopping my shelves specifically looking for fabrics I had lots of when I spotted this awesome Joel Dewberry Deer Valley print I picked up at Marden's. As soon as I saw that the entire plan came together... Seafoam! Whenever I'm faced with how to quilt something I ask myself "What Would Angela Do?" 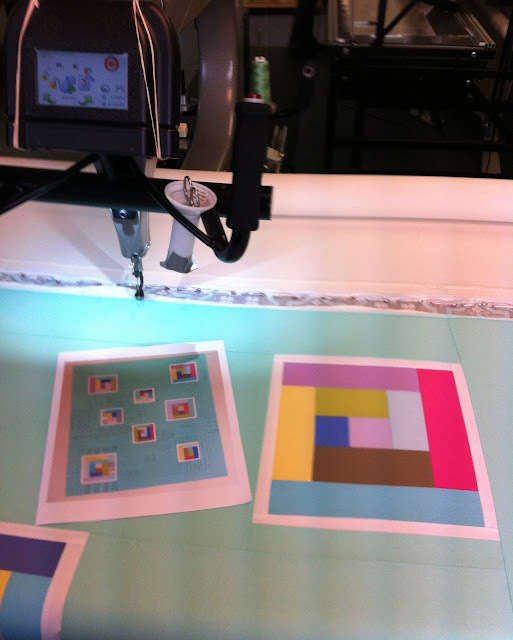 To make the most of my quilting time I made a print out of the finished top and sat down with my go to, Free-Motion Quilting with Angela Walters, to make a plan. This was a HUGE help and saved me from wasting my quilting time trying to think of what to do next though I did make a few changes on the fly based on what wasn't working for me and the realities of working on a longarm. I tried to choose a good mix of patterns: ones I was already comfortable with and some that were new. Some that would be simple and a few that would definitely challenge me. I also tried to make each section large enough to actually get some practice yet not so big that I'd get bored with any one design. What's your favorite FMQ design? WWAD? Brilliant. What a great quilt! I love the story behind it's construction. (Great Marden's purchase!) I keep Angela's book right beside my Sweet Sixteen alongside lots of practice quilt sandwiches!